KeMes stands for a completely new type of angle measurement and is designed for both manual as well as fully automatic quality control on press brakes. The measurement device is fastened to the upper die by means of magnets, thereby enabling measurement directly at the machine without interrupting the production process. Thanks to the simple mounting, the angle measurement system from KEBA can be quickly transferred to any press brake. Complete quality control is possible with KeMes without any additional time – and with maximum accuracy and reproducibility. 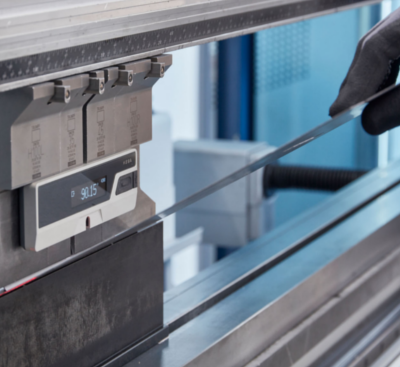 In addition to use on the press brake, KeMes is also ideally suited as a hand-held measurement device and can be used both for quality control during the manufacture of sheet metal parts as well as for incoming goods inspections. Thanks to the patented laser measurement process, no damage occurs to the workpieces. Even large and bulky sheet metal parts can be quickly and easily inspected with the innovative angle measurement device from KEBA. A specially designed function enables continuous measurement along the entire workpiece. It can be used in both manual as well as in machine mode.